Rosemary Mayer (1943–2014) was a prolific artist, writer, and critic, who entered the New York art scene in the late 1960s. By the early 1970s, she became known both for her large-scale fabric sculptures—inspired by the lives of historical women—and her involvement in the feminist art movement. As the decade progressed, Mayer gravitated away from sculpture as a fixed form and the gallery as the primary setting for experiencing art. In 1977, she began to create ephemeral outdoor installations using materials such as balloons, snow, paper, and fabric. Mayer called these projects “temporary monuments,” and she intended for them to celebrate and memorialize individuals and communities through their connections to place, time, and nature. 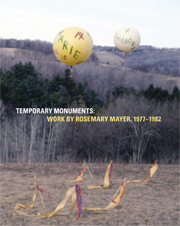 Temporary Monuments: Work by Rosemary Mayer, 1977­–1982 is the first comprehensive presentation of this body of work and includes Mayer’s documentation of these impermanent artworks. Mayer created photographs, writings, artists’ books, and drawings that expand the realm of these projects and reflect her interest in exploring ideas through a variety of media. An introductory essay by Gillian Sneed situates Mayer within the New York art world of the 1970s and ‘80s and argues that Mayer’s public art anticipated more recent practices of site-specific and socially engaged art. MARIE WARSH is a historian and writer who works for the Central Park Conservancy in New York City. She has edited two other publications on Rosemary Mayer: Excerpts from the 1971 Journal of Rosemary Mayer (2017) published by Object Relations and Rosemary Mayer: Beware of All Definitions (2017) a catalogue for a show at the Lamar Dodd School of Art at the University of Georgia, Athens. MAX WARSH is an artist and curator who lives and works in New York City. He is the Associate Program Director for the New Art Dealers Alliance (NADA), and was a co-founder of the artist-run gallery Regina Rex. He received his MFA in Photography from the University of Illinois at Chicago in 2004, and his BA from Sarah Lawrence College in 2002. His work was recently exhibited at the Queens Museum, the Brooklyn Academy of Music (BAM) and the Sirius Arts Centre in Cobh, Ireland. GILLIAN SNEED is an art historian and writer whose research interests include women’s art practices and modern and contemporary art of the Americas. Her writings have appeared in publications including Women’s Art Journal, Flash Art, Art in America, Texte zur Kunst, and The Brooklyn Rail. She is a Ph.D. candidate in art history at the Graduate Center of the City University of New York.